The Healthy Food for All Hackathon was held on Saturday, February 17th, 2018 at the PNC Gigabit Experience Center in Louisville Central Community Center’s Old Walnut Street building. 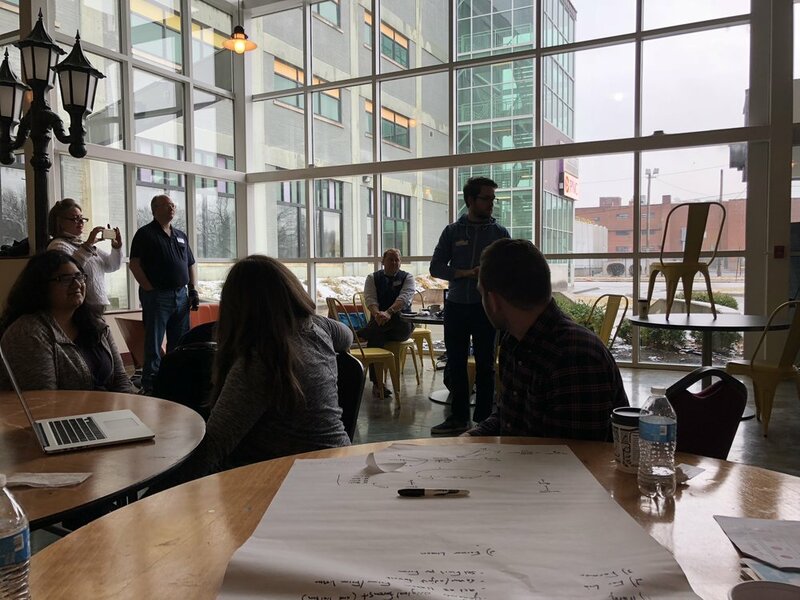 The event brought approximately 70 civic innovators and dozens of engaged youth together to brainstorm solutions for Louisville’s food access resources. Photos by Monique Kuykendoll Quarterman. Prior to the event, participants were provided a video reel of eligible projects to spark their curiosity and creativity. Hackathon organizers kicked off the event with live project pitches from local food organizations and individuals seeking new food-related technologies. Attendees ranged from local tech legends to community organizers to people actively suffering from food insecurity. New Roots, a local organization that organizes the Fresh Stop Markets each year, used the hackers to rethink their digital and consumer engagement strategies. One team began work on an application to support the organization’s complex partnership with local, organic farmers. Another team focused solely on New Roots’ consumer engagement strategy, from assessing their overall marketing strategy to evaluating their new Pollinator model of neighbor-to-neighbor food access support. For more on New Roots, please visit: http://www.newroots.org/. The Lazarus team from the University of Louisville developed a map of local food sources, as part of a project with the Environmental Protection Agency (EPA). They leveraged data from the federal SNAP program and Dare to Care food bank’s online resources to identify specific food access points throughout Louisville. The main goal of their project is to increase access to data that can promote the development of vacant and/or underutilized properties. Good to Grow Green (GTGG), an organization managed by local high school students, gives back to the community by building vertical gardens in classrooms. The gardens are then used to introduce food education and literacy. After the learning modules, the vegetables are harvested and offered to students as a free way to introduce fresh produce into their diet. A group of hackers united to advise GTGG on next steps to market and grow their organization. As progress continued in the main area, Pat Smith of Civic Data Alliance and team members from IDEAS xLab engaged young innovators in the instruction area. IDEAS xLab led the group of high school students, from Eastern Kentucky and Louisville, to explore issues in community culture and representation. One activity involved the design of a more truthful commercial, empowering the students to take control of how their communities’ needs are represented in the media. The students presented their commercials to their peers and other hackathon attendees. Themes of innovation, inclusion and dignity flowed throughout the hackathon. Individuals from all backgrounds were empowered to express community needs and lead projects, including youth and people who struggle with food access. When solutions are developed in diverse partnership, they are more relevant and respectful to the communities they will serve. The Healthy Food for All Hackathon’s unique collision of participation and compassion could serve as a model for future civic projects in the greater Louisville community. If you are interested in volunteering your help to an organization, please visit VolunteerMatch Louisville to find posts related to hunger. The Hunger Innovation Fellowship is a collaboration of the Lift a Life Foundation and the Community Foundation of Louisville to support systems-level food access in Louisville, KY. For more stories from the 2018 Hunger Innovation Fellowship, click here! Monique Kuykendoll Quarterman, MBA specializes in community-focused innovation and partnerships in the Louisville, KY area. As the 2018 Hunger Innovation Fellow, she is actively working to accelerate and elevate the collective efforts of local food access organizations and their partners. The Hunger Innovation Fellowship is a collaboration of the Lift a Life Foundation and the Community Foundation of Louisville.